What if saving the environment was your job? Meet Itzel Morales, the amazing woman we are profiling in this month’s Working Girl Diaries. Itzel is a campaign manager at Green Island Environmental Group. As campaign manager, she organizes environmental education campaigns focused on ways to incentivize recycling and conservation within communities. She also spent seven years as a project manager in the Mexican government, as well as in several Mexican industry sectors. 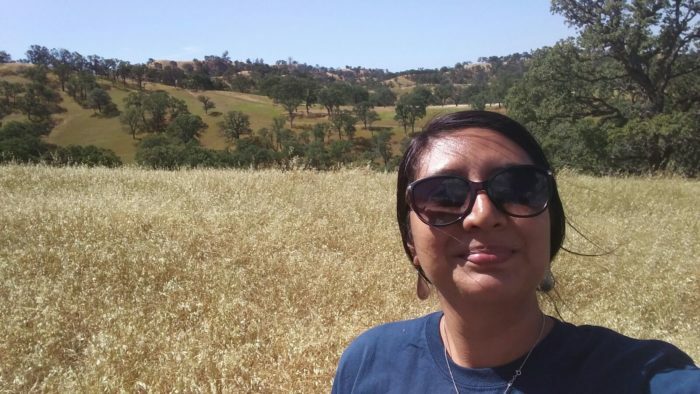 Itzel has a bachelor’s degree in biochemical engineering, a masters degree in climate change studies, and just finished the Hubert H. Humphrey Fellowship at the University of California, Davis. While at UC Davis, she empowered communities to fight climate change and researched natural resource conservation and sustainable development. Itzel is also a member of the Climate Reality Leadership Corps, where she is a Climate Leader and Mentor. If that organization sounds familiar, it’s because it was founded by Former Vice President of the United States Al Gore. The organization hosts trainings for citizens across the globe who want to learn how to incorporate environmental activism into their everyday lives (and you can see these trainings in Gore’s documentary, An Inconvenient Sequel, now in theaters). 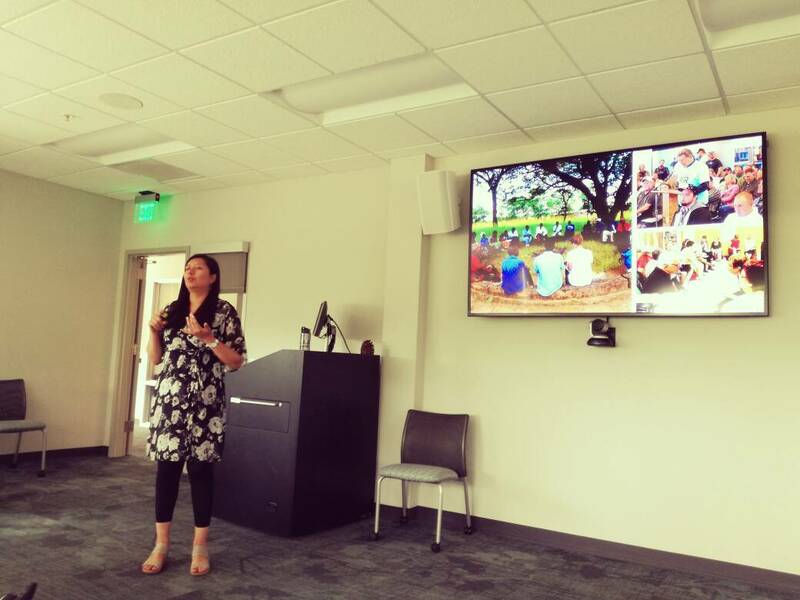 Since becoming a Climate Leader in 2013, Itzel has spoken to over 4,000 people about climate change awareness, forest conservation, and the reduction of CO2 emissions. 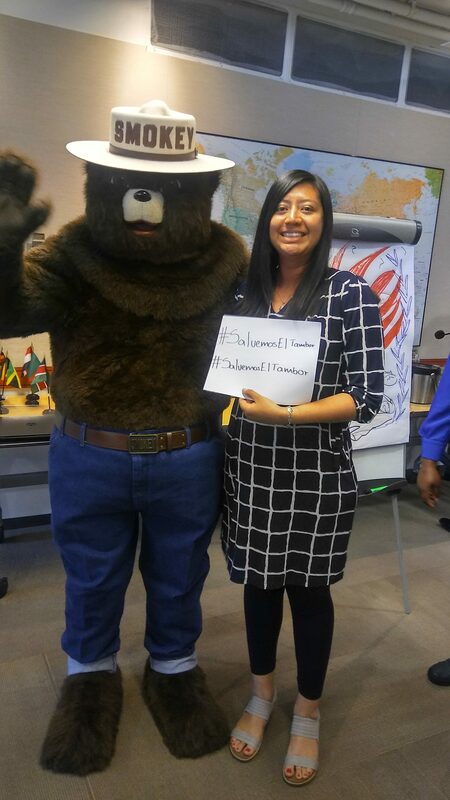 Recently, Itzel worked as an assistant during the U.S. Forest Service Climate Change and Natural Resource Management Seminar. Here are three days in her life! 6:30 a.m.: My alarm rings — but I hate mornings, so I press snooze. 6:45 a.m.: It is really time to wake up, or I won’t have time for breakfast. I shower, then eat a quiet breakfast with my roommate, Jing, who is a Humphrey Fellow from China (we’re not morning people). 7:45 a.m.: Once I am ready, I text my friend Adnane, another Humphrey Fellow from Morocco who is working with me as an assistant in the climate change seminar. We like biking to work together. I treasure these morning bike rides, especially now that the trees are green and California poppies are in bloom. 8:00 a.m.: As an assistant, I make sure that everything runs smoothly during the day. I get to the seminar early so I have time to chat with other participants when they arrive. I love to talk to people from different places and learn about their cultures, so I am having the best time. We are 28 people from 23 different countries, and we all work in climate change and natural resource management. 8:45 a.m.: We have a Skype call with Evan Girvetz, who is a senior scientist in the International Center for Tropical Agriculture (CIAT) in Nairobi. 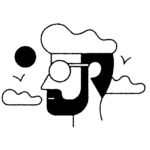 He talks to us about climate smart agriculture, which focuses on developing policy, infrastructure, and investment conditions in order to achieve sustainable agricultural/food security under climate change. Climate smart agriculture is also focused on helping farmers become more sustainable to increase their productivity/income, and is reducing agriculture’s contribution to climate change. 10:30 a.m.: After enjoying a break with plenty of snacks and coffee, we are ready to have the second presentation of the day. This time, we welcome Ellie Cohen, president of Point Blue, an organization focused on conservation science. Ellie really knows how to tell a story and engage the audience. She makes it so easy to imagine the beginnings of Point Blue in 1965 and envision how it’s grown to now have a staff of 160 people and 2,000 technical reports and peer-reviewed scientific articles. 12:00 p.m.: After being inspired by Ellie, we grab lunch boxes and get ready to visit Bobcat Ranch. One of my best friends in the seminar is Munshida from the Maldives. I’ve learned so much from her — we share a special bond as we both come from islands. Bobcat Ranch is managed by the Audubon Society. The ranch is developing infrastructure to allow for better management of cattle. They want it to become a hub of research, conservation, education, and outreach for conservation practitioners, ranchers, and the public. We take a walk around the ranch, and learn that the ultimate goal is to use Bobcat Ranch to promote sustainable ranching methods, and to restore habitats for birds and other wildlife on ranches throughout California. 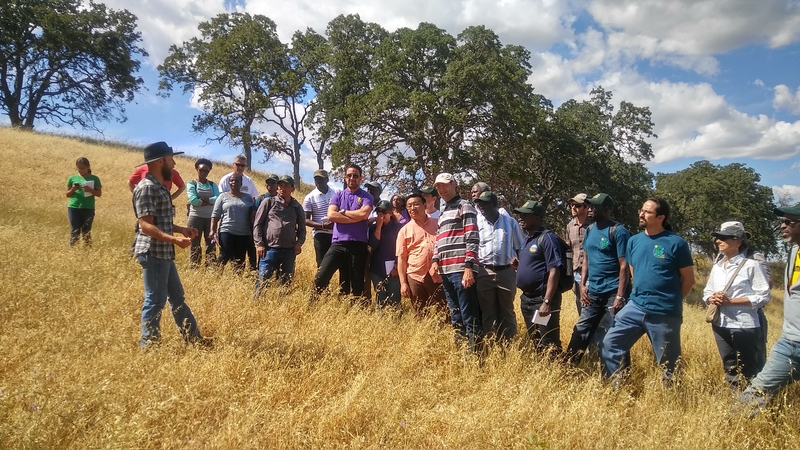 4:20 p.m.: We say goodbye to Bobcat Ranch and head to Russell Ranch at UC Davis, a 300-acre facility focused on researching agricultural growth in a Mediterranean climate. Professor James Quinn tells us about The Century Experiment, which measures the long-term impacts of crop rotation, farming systems, and the impacts of water, nitrogen, carbon, and other elements on agricultural sustainability. 6:00 p.m.: We go back to campus where Adnane and I pick up our bikes and ride home. 7:00 p.m.: I don’t have much time for dinner, so I warm up some lentil soup that I have been saving for a special occasion. Tomorrow, I will present at the seminar — something that I consider to be one of the highlights of my year. I will be talking to 28 people from 23 different countries! I make some green tea and start practicing the stories I will be telling in the morning. During my year in the U.S., I have learned that the best way to reach an audience and connect with them is to tell stories. After talking and listening to Ellie, I am confident that I will do a good job, but I can’t stop feeling butterflies in my stomach. This happens to me before every presentation! Why?! After all, this is my 39th presentation overall, and my tenth presentation in the U.S.
11:00 p.m.: As much as I want to continue practicing, it’s time to go to bed. I need at least seven hours of sleep if I want to be 100% ready to give a presentation. 6:30 a.m.: This time, I don’t need to hit snooze, as I am a bit anxious about the presentation. I am counting down the hours until it is over. I remember that once I am in front of the audience, I will be okay. I pick one of my favorite dresses and decide to leave my hair down for the big day. Today, my roommate is traveling, and I miss having breakfast with her and sharing morning laughs. (Also, she gives the best compliments. Hearing her say she likes my floral dress would be GREAT right now). 7:45 a.m.: Adnane and I meet up downstairs and start our morning bike ride to the seminar. 8:00 a.m.: Once again, I make sure that the coffee and snacks are ready for the day before I greet my friends. Many of them know my presentation is coming up, so they wish me luck. 8:30 a.m.: Our facilitator, Pam Foster, gives a presentation about the best practices for implementing change in our environmentalist organizations. She discusses emotional intelligence, leadership, and negotiation. Pam has this amazing energy. She speaks in a way that makes us feel like she is revealing priceless, top secret information to help us incorporate climate change activism in our daily lives at work and with our families. Here we are distributing notebooks made with recycled paper in Mexico. 10:45 a.m.: This is it. The moment I have been anticipating for the past four months is here — it’s time to present. I begin talking about different strategies for community engagement while I tell stories from working with Green Island Environmental Group back in Mexico — how we have been learning from our mistakes, working hard to understand the needs of our community, organizing better campaigns to incentivize recycling, and engaging our volunteers so they are happy to keep working with us. I keep presenting, walking from one side of the room to the other, telling my stories and making some jokes that come naturally. I am not nervous anymore — in fact, I don’t want the presentation to end; I am so happy to share my experiences. 12:00 p.m.: It is time for a delicious lunch! 1:00 p.m.: Now, other participants share examples of the communication strategies they’ve used to solve environmental issues in their communities. We listen to Munshida, who talks about her work with the International Union for Conservation of Nature (IUCN). She explains that they are creating awareness about coral bleaching. However, since many people don’t know how to swim, they have never seen the reefs, making it difficult to engage them. We also listen to Vadim Nee from Kazakhstan, who told us about the political persecution of an environmental activist in his country. 3:15 p.m.: I meet with a team of leaders from Kazakhstan, Egypt, Zambia, Maldives, Mongolia, Myanmar, and Mexico. We discuss legislation and climate change in order to prepare a future presentation. 5:00 p.m.: The seminar ends for the day. I drop off my computer at home, and take a nice bike ride to celebrate my successful presentation. After the bike ride in the Davis Green Loop, I do some grocery shopping to make myself a nice dinner. 9:00 p.m.: After talking to my boyfriend on the phone, I am ready for some Netflix. 10:00 p.m.: I get a call from a friend in Mexico. We spend hours talking about life and love. 1:00 a.m.: I fall asleep. It has been a very long day. 7:00 a.m.: I wake up a little late. I am feeling very tired, but there is no time to rest. We are traveling to San Francisco today. I take a shower and make myself a sandwich for the road. 8:30 a.m.: Adnane and I meet up with the other participants and start our journey to San Francisco. We share the van with friends from Zambia, Bangladesh, Tajikistan, Kazakhstan, Israel, and Morocco. This road trip — like all of our road trips — consists of jokes and our quest to find the perfect radio station. 11:30 a.m.: We arrive to Muir Woods for our first stop of the day. We enjoy a lovely walk among the coastal redwoods while a ranger explains the challenges that Muir Woods faces due to climate change. This part of the trip was planned so we could see the big trees, and I was so struck by the beauty and dignity of the Sequoia sempervirens. 1:00 p.m.: We have lunch in the van and go to Vista Point, where we take a group picture with the Golden Gate Bridge in the background. Then everybody tries to take their best selfie — I must admit I am not good with selfies. 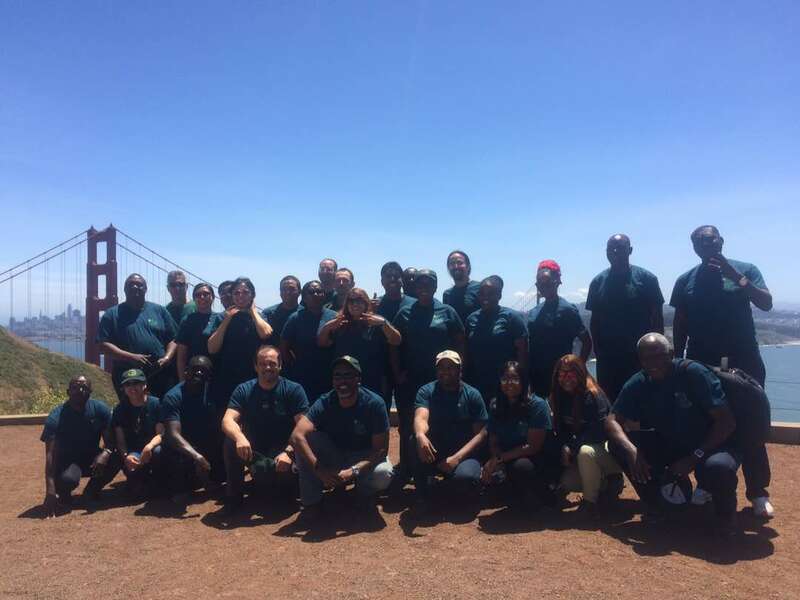 2:30 p.m.: We visit the offices of the San Francisco Department of the Environment to learn about their different sustainability programs and their strategy called 0-50-100-Roots. 0-50-100-Roots aims to have 0% waste, 50% sustainable car trips in the city (by encouraging mass transit, carpools, biking, etc), and 100% renewable energy to protect urban green spaces and San Francisco’s biodiversity. This is my second time visiting SF Environment — you can tell they walk the walk, as their offices have LEED certification, plants all over the place, light coming through lots of windows, an art collection rescued from a nearby landfill, and a roof garden designed by the staff. 5:00 p.m.: It’s time to enjoy our time in The Bay, so like good tourists, we go to Pier 39. We watch the sea lions, eat clam chowder and fried fish, and enjoy the sunset. San Francisco is notoriously chilly during the spring, but Adnane refuses to wear a sweater — until he finally gives in and buys a bright orange $5 hoodie at a souvenir store on the pier. 7:00 p.m.: We head back to Davis, traveling in three vans and communicating through radios. At some point, our professor, James Thorne, decides to start a singing competition. Each van has a chance to sing a song and freestyle about sustainability. My friends from South Africa, Maldives, and Zambia totally won. 9:00 p.m.: We arrive back to Davis safe and sound. I am so tired, but manage to stay awake long enough to take a shower and actually get ready for bed. I call my boyfriend, tell him about my day, and fall asleep. Three more days of the seminar to go!